Regarding Philippine native/indigenous writing systems: the popular name for it, "Alibata", was coined by Paul Verzosa in 1921. The older and more correct term, "Baybayin", has been mentioned in several publications dating back to just right after the Spanish colonization began and throughout the 17-18th centuries as the word that the native population used to refer to their writing. "Verzosa's reasoning for creating this word was unfounded because no evidence of the baybayin was ever found in that part of the Philippines and it has absolutely no relationship to the Arabic language. Furthermore, no ancient script native to Southeast Asia followed the Arabic arrangement of letters, and regardless of Verzosa's connection to the word alibata, its absence from all historical records indicates that it is a totally modern creation." ~ Author (Paul Morrow) does not use this word in reference to any ancient Philippine script. Yes, Alibata is a misnomer (an improper name). However, it is already a part of the Filipino vernacular and it would be a challenge to completely dismiss the word. The term Alibata has been used in print and was part of academia during the nationalistic era of the Philippines in the mid to late 20th century. While the word "baybayin" retained its original meaning "to spell or write", its relation to the script & writing system was almost forgotten. It's not until authors like Paul Morrow, Carl Rubino, Hector Santos, et al.began using it again in the 1990s and with the rise of the Internet culture's easy access to information that the term is brought back and slowly regained popular usage; associating it again with the original Philippine script. 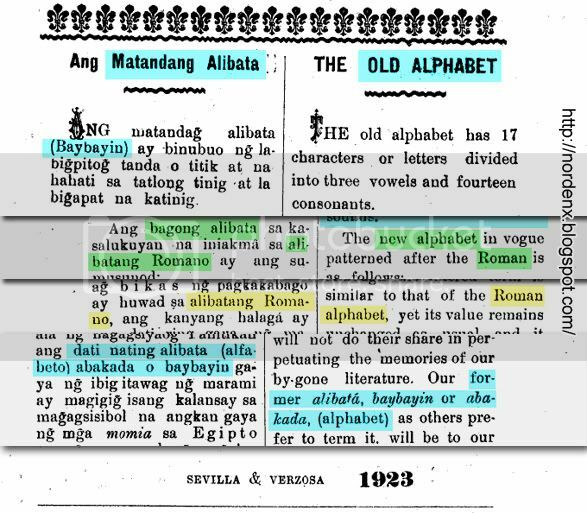 An interesting find and observation; author Paul Verzosa and Jose Sevilla, in a 1923 book, used the term "Alibata" not just for the native script but for all forms of writing. He specifically called the Tagalog script "Baybayin" and called the alphabet "Alibatang Romano". It is quite obvious from the book that Verzosa intended to replace the word Alfabeto (Spanish Alphabet) with a more native sounding word. He also acknowledged that the popular terminology used at the time were Baybayin and Abakada. Basically, to Verzosa, the word Alibata = Alfabeto = Alphabet = Abakada = Abecedario = Kana, etc. etc. not just particularly referring to Baybayin script. Which is why Alibata is actually not the name of the various Baybayin Scripts of the Philippines but just a made-up word for "Alphabet". So, the word Alibata is based on letter names from Arabic Abjad, but Filipino Muslims did not adopt or use Baybayin script, and Alibata's actual meaning is "alphabet". While Baybayin is Indic/Bramic in origin (it is not an alphabet nor an abjad, it is a syllabary) the original arrangement of Baybayin characters actually wasn't even in the same sequence as the western a, b, c's or even abakada (more about that in another article). Alibata does not mean Baybayin Script. Baybayin Script is not Alibata since it is not an Alphabet. Yes, Alibata is a made up word, but so is the accepted term Abugida (alphasyllabary) a word that was just coined recently in 1990. Alibata was coined and used in the 1920s and is still in use today; it predates the word Abugida. Therefore it is hard to dismiss Alibata as a legitimate word even though it is a misnomer since it has been established and used for decades (mistakenly exclusively to mean "Baybayin Script", mind you). But being a misnomer it only creates confusion and it is my humble opinion that it is time to retire the word Alibata and leave it as a footnote in Philippine history books. Other: Difference between Alibata & Baybayin. Hanunoo Script - from the Hanunuo tribe. Buhid Script - from the Buhid tribe. Kulitan Script - or the Pamagkulit is used strictly for the Kapampangan language. Sulat Tagalog - based on a typeface introduced in the Tagalog version of the Doctrina Christiana. Surat Ilocano - based on a typeface introduced in the Ilocano version of the Doctrina Christiana. Suwat Bisaya - based on typefaces in Austrian and Italian books, particularly the one by Lorenzo Hervas. Guhit, Basahan - two words used by Bikolanos for Baybayin. ...other native terms for baybayin are: Kurditan, Kinudlitan, Katitikan, Sulat Filipino, and the misnomer Alibata.